Ladies and Gentlemen, may I present “Square With Flair?” This is SWF’s first article as a blogger, guest or otherwise, and I think that you will find much to appreciate. As is always the case with my readers, I’ve learned a thing or two. So without further ado, I leave you to your reading. Characteristic of great hostesses and hosts is originality in the presentation of food and refreshments. Jackie Kennedy, Pauline de Rothschild, the Duchess of Windsor, and nowadays Martha Stewart, set luncheon, tea, and dinner tables, in unique and memorable ways. Recently perusing the heavy auction catalogs of the Duke and Duchess of Windsor, I was impressed by the number of different services and dishes the Duchess used for her famous dinner parties and carefully conceived table settings. Price was not necessarily a consideration; she had everything from inexpensive, cheerful, Italian peasant pottery to museum quality Meissen and Sèvres porcelain. She was aware that simple meals can be made extraordinary by unusual presentation or variations, and monetary value did not always guarantee the desired chic effect. One of my favourite pieces of china to use when entertaining and serving is the breakfast cup. One seldom sees them any more. These jumbo cups and saucers hold a more generous, almost double, capacity. They avoid the preciousness of the regular teacup which sometimes seems too formal or outdated for our casual lifestyles. In the era of supersizing, this cup impresses guests as generous and luxurious. I pick mine up at antique shows, or eBay, where typically they are much less expensive than new pieces. As they were intended for breakfast, the most casual meal, they are most often earthenware, and were made by manufacturers such as Burleigh, Johnson Brothers, Doulton, Royal Worcester, Spode, and Wedgwood. If china or porcelain is one’s preference, breakfast cups exist in fine Limoges porcelain or the prestige bone china of Royal Crown Derby. If you are having a brunch or afternoon tea, or really anytime tea or coffee is served, breakfast cups are wonderfully pampering. They also mean the hostess can be more relaxed because she has to fill them up less frequently! The wide and generous under saucer easily accommodates cookies, biscotti, cucumber sandwiches, or small slices of cake. While casual circumstances often permit the use of mugs or “beakers” as they are disparagingly named in the U.K., mugs present the problem of where to place the wet, dripping spoon, don’t hold a finger sandwich, and certainly don’t look elegant. Lastly, for an original, memorable, and amusing touch at a meal, the breakfast cup may be used as a good size bowl during the soup course, and is wonderful for this purpose, either with or without a spoon. 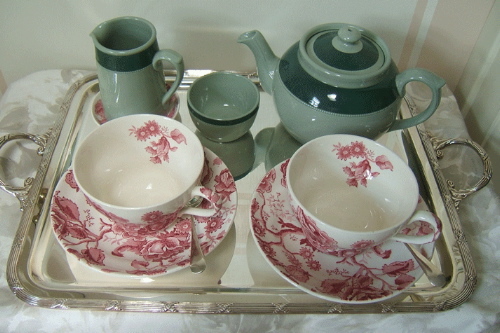 Most commonly, breakfast cups seen at antique shops and shows are in classic monochromatic Staffordshire transfer ware in pink/red, blue, or brown. This gives a wonderful effect similar to the classic French Toiles de Jouy. I find the pink-red great for spring, summer and Christmas. Brown looks rich and warm for fall and winter, especially by the fireside. 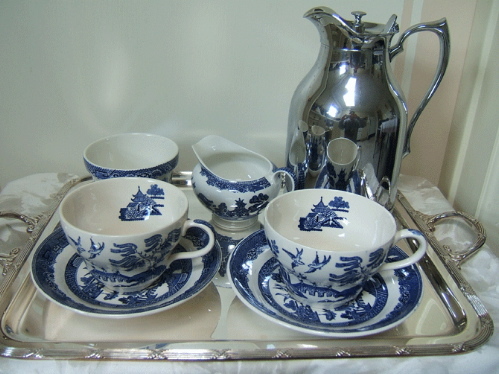 Classic under glaze blue, as seen in the blue willow pattern, looks crisp and delightful for any season. Next time you see the long forgotten breakfast cup at a tag sale, pick it up and give it a test run. You’ll be pleasantly surprised! This entry was posted in Living and tagged Breakfast Cups, Burleigh, Doulton, Johnson Brothers, Limoges porcelain, Pauline de Rothschild, Royal Crown Derby, Royal Worcester, Spode, Square with Flair, Staffordshire transferware, Wallis Duchess of Windsor, Wedgwood. Bookmark the permalink. I love breakfast cups and use them every day.I have some in fine white porcelain,made by Richard Ginori, which I use for tea. I drink china tea without milk, and it tastes best in a porcelain cup, but I like a large one. For coffee I have some unglazed pottery cups and saucers ,pale turquoise colour- the saucers are large and almost flat, so they double up as small plates for biscotti or a slice of panettone.Mugs, no thank you; as you say, nowhere to put a teaspoon, and they make rings on the table. And they just don’t look so elegant. 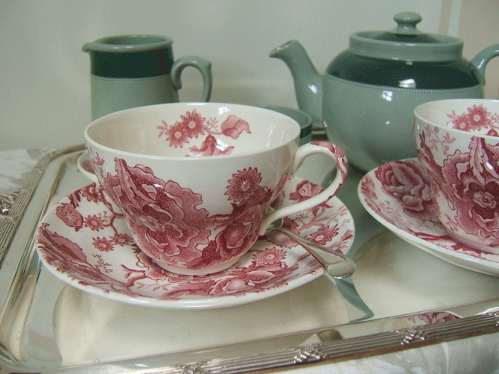 The two tea cups and saucers in red colours in your 3rd and 5th pictures are exquisite! I love drinking tea – especially it always taste better if you drink it out of a teapot! I hate it when people make a cup of tea out of a mug…even worse – in a microwave! 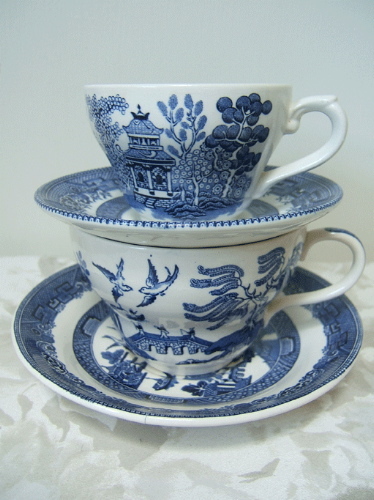 Nothing better and more classic than a cuppa in a lovely Blue Willow cup & saucer! Jolly well done for your first blog “Square with Flair”! Each service is beautifully presented and you give us a thorough inside peek at an industry with royal roots and tea leaves. I cannot drink tea from anything other than fine-bone china. It really does affect the flavour. Looking forward to your next foray. 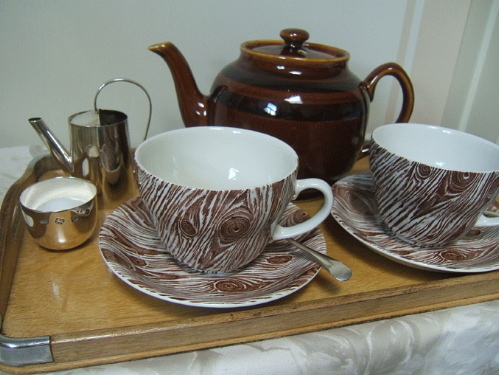 love, love, love the brown “wooden” cup and saucer. Another fun use for the oversized breakfast cup is ice cream–silver demitasse spoons are good for small bites, or choose vintage European silver plated spoons–which are always quite large, if your are inclined to make quick work of it. Our breakfast cups are an Austrian green and white swirl pottery so cherry chip, peppermint stick, spumoni, and chocolate look particularly good in them. We serve chili in breakfast cups on cold November weeknights, and I also set them up on a pewter tray, stacked, with small boxes of cereal and a matching cream pitcher of milk for house guests. 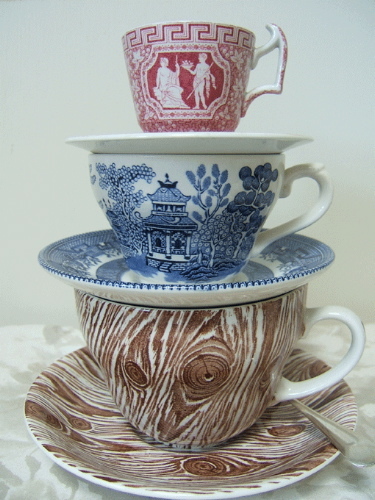 Mixed sets (an oxymoron) of china are a passion of mine–I have about two dozen demitasse cups–the complete opposite of the breakfast cup– and saucers and would love to hear suggestions on how to use them when not sipping espresso or chocolate. P.S. I got side tracked with ice cream and forgot the important thing–in my climate (long & cold winters), breakfast cups are called “hot chocolates.” In fact, on the price list for my Austrian pottery, they also list the cup I am referring to as a hot chocolate. In a favorite hotel in Vail, they serve hot cocoa in these enormous cups as well. The shape of the cup is less traditional than the beautiful ones pictured above. But they are essentially very wide-mouthed oversized cups. All great and a pleasure to live with. I think they encourage generous portions and keep one’s hands warm while sipping–tea, hot chocolate, or au lait. It’s in the summer when we fill them up with ice cream. Hi Paula, I use demitasse for chocolate mousse, too. Love the breakfast cereal tray for the guests. Lovely images Chris, I love the oversized breakfast cups ….they give me the jolt I need withought leaving the computer whilst checking my favorite blogs! Karena, they are all courtesy of SWF! Hasn’t he done a good job of it? I have an extensive collection of RCD and I have my tea everyday with a different pattern. It brings civilization to my life.